The Juristic Office at the Institution of the late Religious Authority, His Eminence, Sayyed Muhammad Hussein Fadlullah (ra) issued a statement in which it declared that Wednesday 10-10-2018 is the first of Safar 1440H according to the jurisprudential opinion of the late Religious Authority, His Eminence, Sayyed Muhammad Hussein Fadlullah (ra). 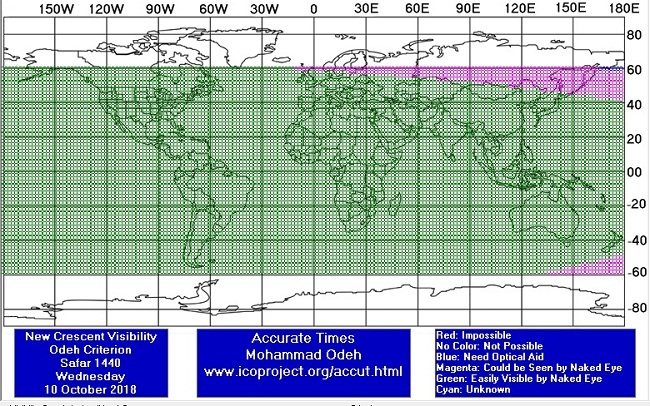 The new crescent (central conjunction) for the month of Safar 1440H. will be born on Tuesday October , 2018 A.D. at 06: Beirut time. The crescent cannot be sighted, Tuesday evening, by the naked eye in Beirut, but it can be seen by the aid of telescopes, in many regions in the world, whether by the naked eye or with the aid of telescopes. 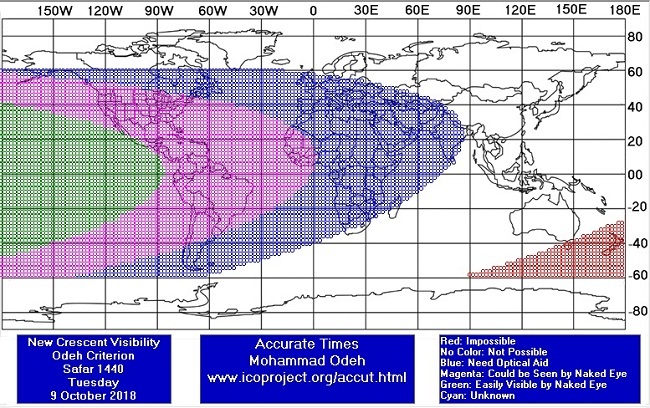 Therefore the month of Muharram will be short and Wednesday 10-10 2018 is the first of Safar 1440H in all the eastern and western regions, in accordance with the jurisprudential opinion of the late Religious Authority, His Eminence, Sayyed Muhammad Hussein Fadlullah (ra) who considers that the beginning of the month is established if the crescent can be sighted in any region with which we share a part of the night, whether by the naked eye or by the aid of telescopes. We invoke Allah to make it a blessed year on the Muslim nation, and to increase the reward of the believers and ward off any harm that might inflict them. He is the Most Merciful.